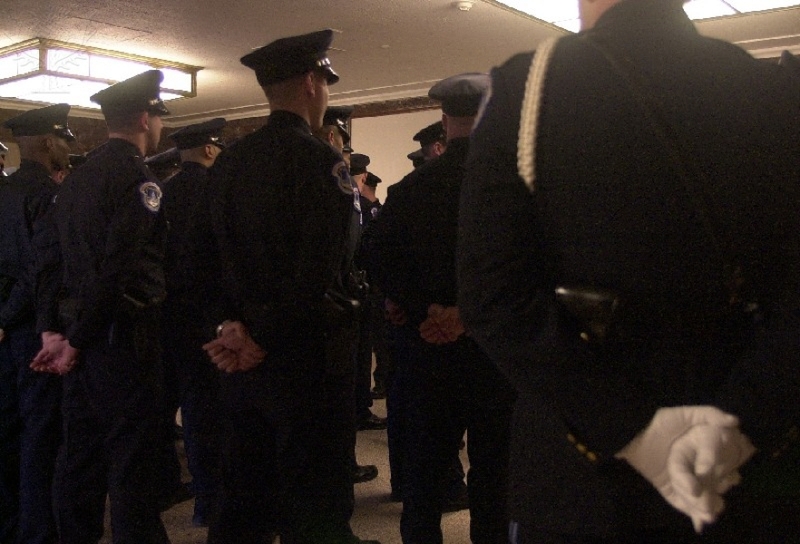 It has never been easy to be a Police Officer, according to my father, who was a member of the Bridgeport Police Department for twenty-five years. The stress that anything that can happen will happen, fear of making the wrong decision or action, and just having almost everyone just plain hate you and love firemen instead makes it hard. With today’s police all over the country being caught up in scandal after scandal that just further disenchants them to the general public, it is harder now to be a cop and could possibly make it harder to make more cops. It ultimately brings up the question: Is there still a desire among young people and students to become a police officers after being heavily criticized in the media and by the general public for actions they have been caught up in as of recently? Standard police recruit graduation. Photo by Chris Maddaloni (Roll call Photos Inc.), courtesy of Britannica ImageQuest. Recently the Bridgeport Police Department had a test looking to hire a substantial amount of new officers and on this test all Bridgeport residents were given a 15 additional points to their final scores as reported by News 8 back in January of this year. It was also reported that Mayor Bill Finch was “hoping to recruit local qualified candidates from community outreach.” The department even had their own day here at HCC set up at a table with applications, looking for students interested in the job. This is all to fill the 70 spots the department has vacant after influx in retirements and transfers. It can be said this is an indication that departments are looking to hire people who are also members of the community in an effort to better reach out to the public; especially after national incidents like at Ferguson, Missouri and in New York Times Square that might have further alienated the public from the police. HCC Professor of Criminal Justice and former Stamford Police Officer Joanne Anzenberger makes the point that the media plays a substantial role in upping the hype with the events, and although policing is down that might not be the reason. “People today are not pursuing the field in such great droves as before; but only those who have a passion for it and really want to be on the force will” she said. Anzenberger makes the point that the politicization of the job by the media on both sides is what makes it such a harder job for people who do it, and a little less enticing to new recruits. “Technology has changed everything, and because of it everyone has an opinion they can share with the world. This along with the media has created an environment with putting some facts and some viewpoints out there for people to take” she explains. She firmly believes that one of the best solutions to finding people who want to be police officers today, is community outreach similar to what Bridgeport has done. In sum she said it creates a bond and trust between both the departments and communities which is something you want that gives back to both sides. Regarding the opinion and possible disenchantment of students today with the police, Anzenberger notices that there are indeed issues. “One of the big issues with students is they think when they file a complaint after the police do something nothing is really done in response but instead thrown to the side” she says. However, she makes the point to them that departments do follow up, it is just not publicly. Professor of Psychology and former Milford police officer John Sopchak also acknowledges there is an inherent mistrust of the police in a faction of society today. “It is a cyclical thing. Back in my day when I was becoming a police officer it was the time of the counterculture and Hippie Era that did not see the police in a favorable eye” he said of this mistrust that is bigger at times than others. Recently here at HCC there was an event held in the Public Arts Center(PAC) of Lafayette hall hosted by Professor Geoffrey Sheehan in which students and public could ask questions and explain concerns to both current and former individuals in law enforcement. Along with Sopchak, speakers included Professor Vern Krill of HCC, Stratford Police officer Omar Jimenez, and Officer Ortiz and Captain Porter of Bridgeport. “It went great, we really got a huge turnout and got a lot of people talking and asking questions. Things like this and community outreach are huge in the aspect of reaching people and those who live in it are much more interested in helping it” Sopchak said of both of the event and the general trend that departments like Bridgeport are taking. It seems there will always be an underlying mistrust of the police, and with both technology and the media changing the game and playing field it seems it has really boiled to the surface in today’s society. It leaves us with the question of whether or not law enforcement’s efforts to reach out to those closest to them will help in the long run?